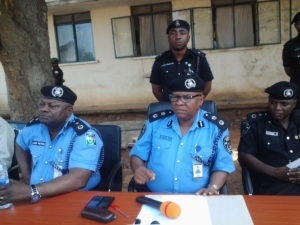 Police in Kwara state arrested several electoral offenders in connection with the local government elections held on Saturday, November 18. About 54 persons are currently in the police custody in Kwara State for electoral offences and for participating in illegal street protests. The state Commissioner of Police (CP), Lawan Ado, at a media interaction on Monday, disclosed that the arrested persons were picked up in connection with the issues relating to the local government elections held on Saturday, November 18. Bounce News learnt that two among the electoral offenders; Adeyemi Abolanle and Olajide Samuel, were accused of burning ballot papers at a particular polling unit which was, according to the police chief, a punishable offence. Mr Ado then advised those with grievances over the concluded elections to opt for the legally allowed option of approaching the judiciary. He reiterated the resolve of the Kwara State Police Command in ensuring that anyone involved in illegal protest was brought to book.